The Little Oak Tree: It's a jungle out there! The Little Oak Tree was recently contacted by a mum who wanted us to create a jungle animal cake and matching cupcakes for her son's 8th birthday party. 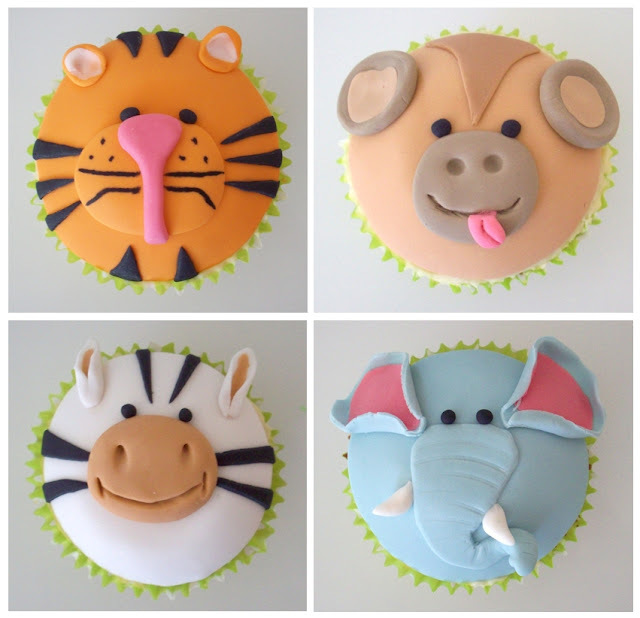 We were told that Dylan loved anything to do with the Jungle and I think Trudy certainly put the animal in the jungle with these gorgeous cupcakes. My personal favourite is the elephant, which is your favourite? Close up aerial view of the jungle cake. The monkeys are so cheeky! Classic chocolate mud cake and chocolate ganache, covered in fondant with hand made fondant animal figurines, yummo. We are sure this cake made one 8 year old very happy! All of our cupcake designs are completely customisable and can include corporate logos or perhaps the hubby's favourite sports team so you are only limited by your imagination. Why not contact us at thelittleoaktree@exemail.com.au to discuss your ideas for your next party or gathering. They also make a lovely bespoke gift for that special someone. Prices are available upon request and are based on the detail and size of each cupcake and quantity ordered. All images unless otherwise stated are the property of The Little Oak Tree. If you would like to use any of our images please link back to this blog. In turn, we believe in providing credit for all sources and images. Please let us know if a source or link is incorrect.